Discovering that we had survived the night undisturbed we decided to prank the boys and hide the car. Neither of them found our giggling rendition of the missing car that convincing. The journey continued in this startlingly beautiful fashion, light hitting snow capped mountains, colourful houses making up the tiny port settlements, until we burrowed through a long 6km tunnel under the mountain, the first time we had seen darkness in Iceland, and emerged to a green mountain pass. 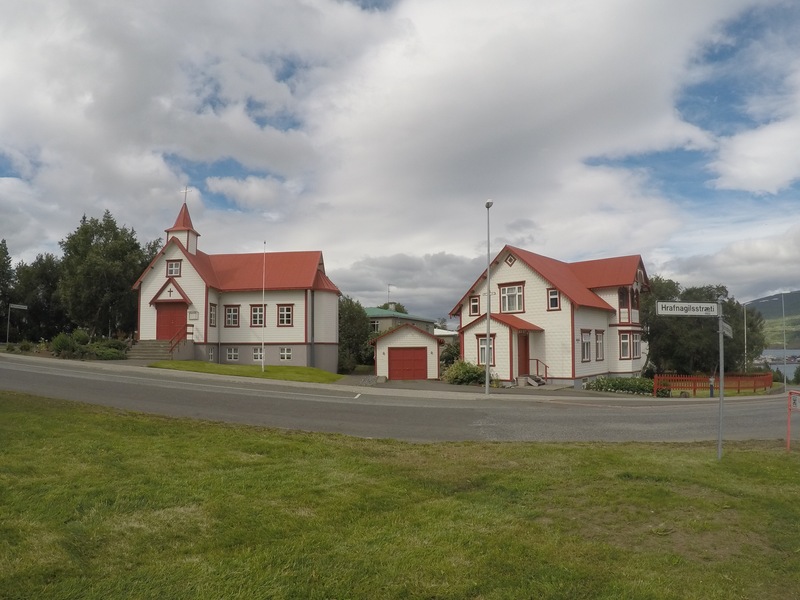 The crazy thing about the ring road, state highway 1, is that it’s technically the main road in Iceland but has no hard shoulder and only one lane, often dropping away steeply at each side. Barely is there a car in view infront or in the mirrors and it is often dwarfed by the landscape. 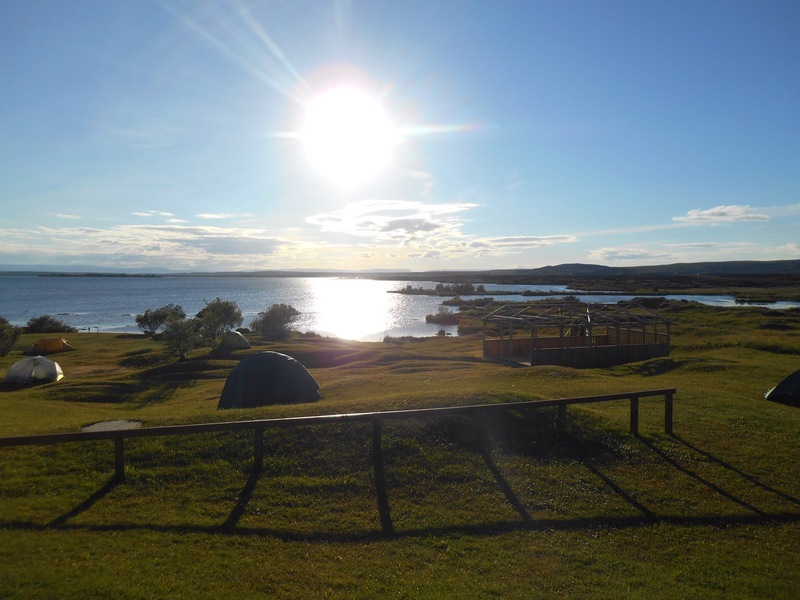 The boys made a playlist of hit after hit which fuelled our enthusiasm for the amazing views. 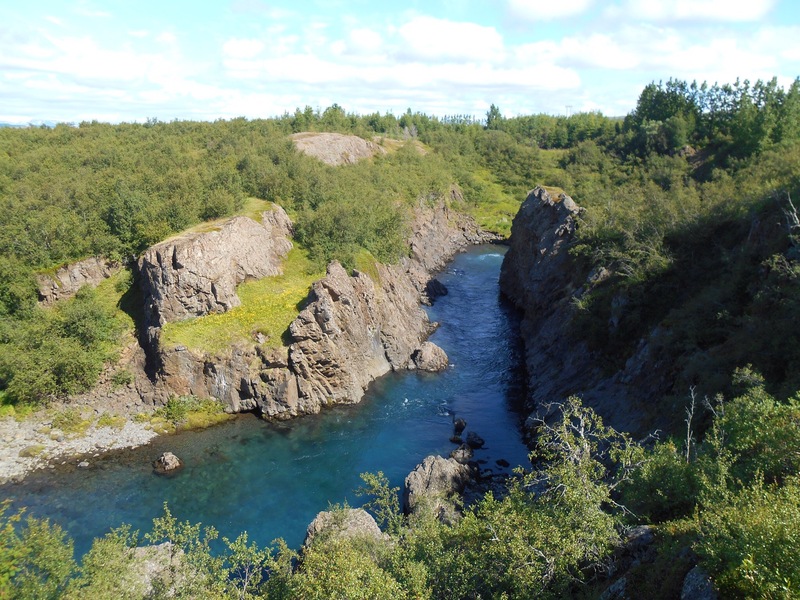 At the first small town we got out for a leg stretch and stumbled across a gorge. The water passing through was crystal clear and inviting until we calculated how fast flowing it was. Cal’s sensible alter ego ‘Carol’ decided our travel insurance would not cover accidents caused by irresponsible weak swimmers. 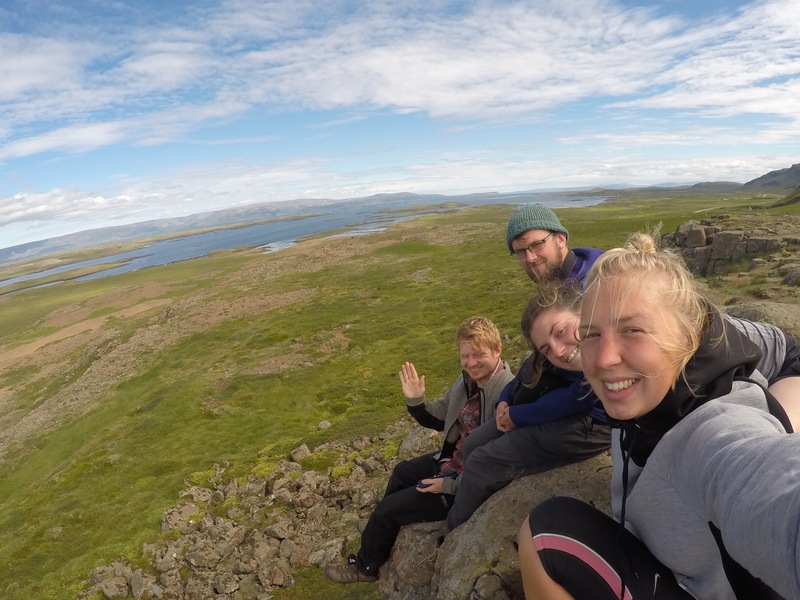 Further along the highway we stopped for more waterfalls and panoramas until we forked away from the ring road to find Detifoss. 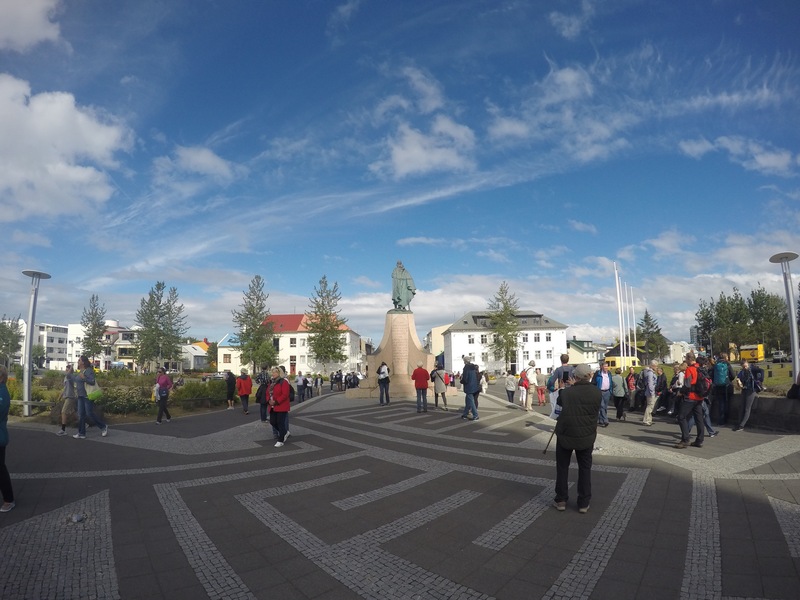 Detifoss is Europes most powerful waterfall, 45 metres drop and 100 metres wide, yet it is 28km up a road which turns from mud to uneven gravel only accessible a few months of the year. In fact this is characteristic of most deviations from the ring road. 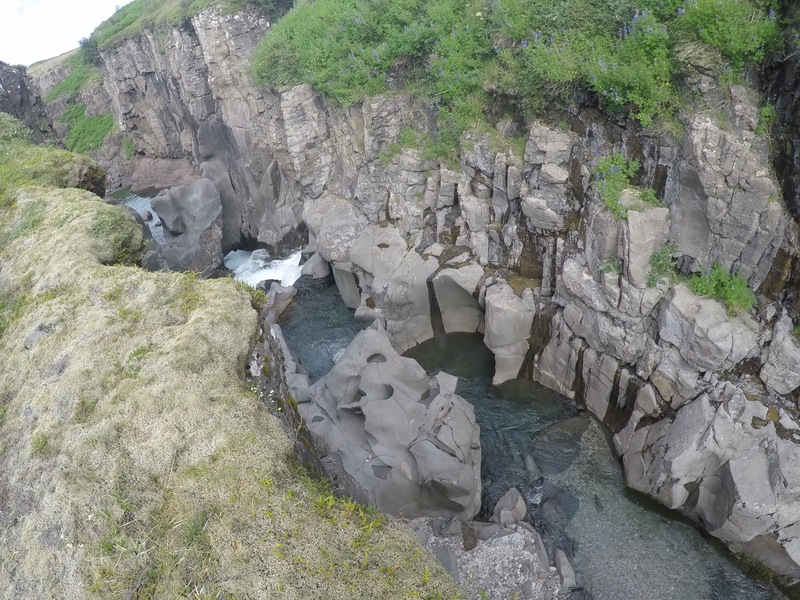 The waterfall was spectacular, basalt columns lining the gorge and mini waterfalls running off these as the most reformed on the rocks. 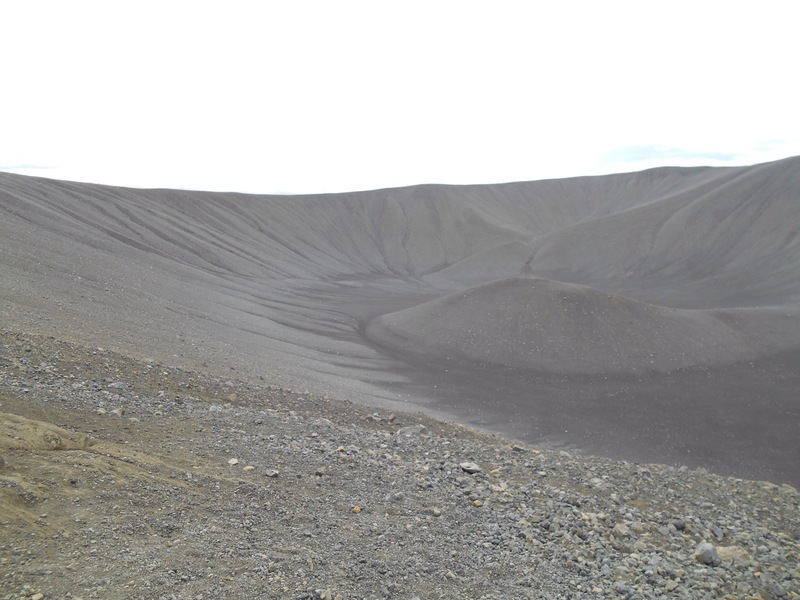 It leaves no evidence of its presence as it lies in the middle of what appears most like a sparse desert like landscape formed of lava of all beautiful colours. 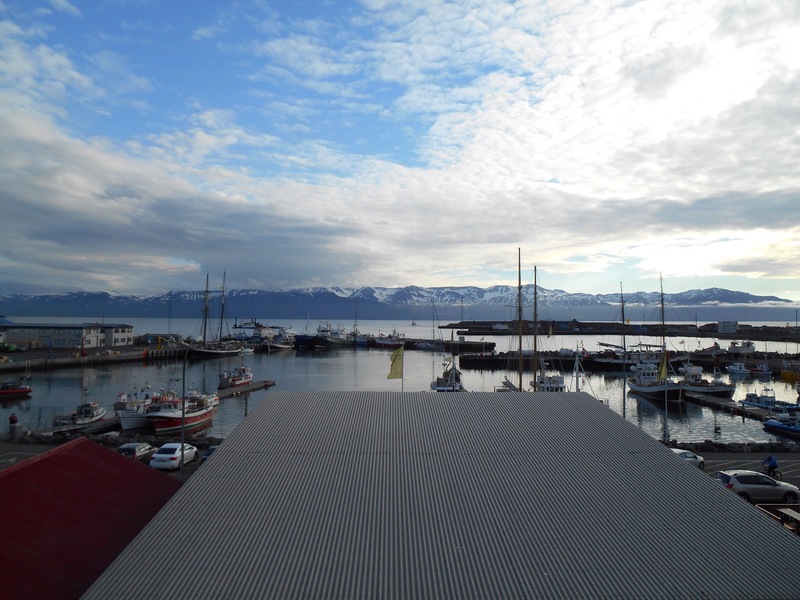 Our resting point for the night was the northern town of Husavik, literally meaning house port. It was a beautiful town particularly in the glimmering golden evening light. 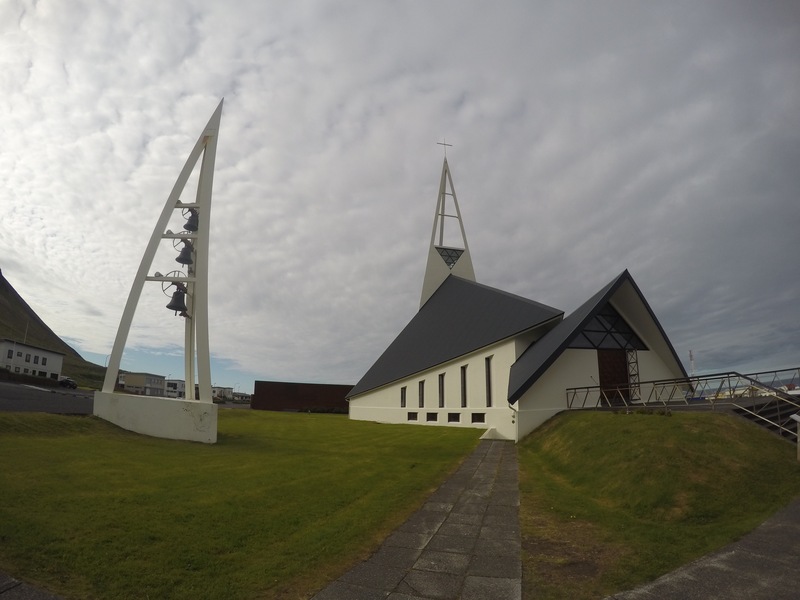 The church across from the port and coloured houses gave it such Icelandic character. We made dinner overlooking the port and had a few rounds of cards before making our home for the night in the town campground. The morning was sunny and the water still, blue water twinkling below snow capped mountains. The others decided to take a boat whale watching as these big mammals congregate on the north coast of Iceland. 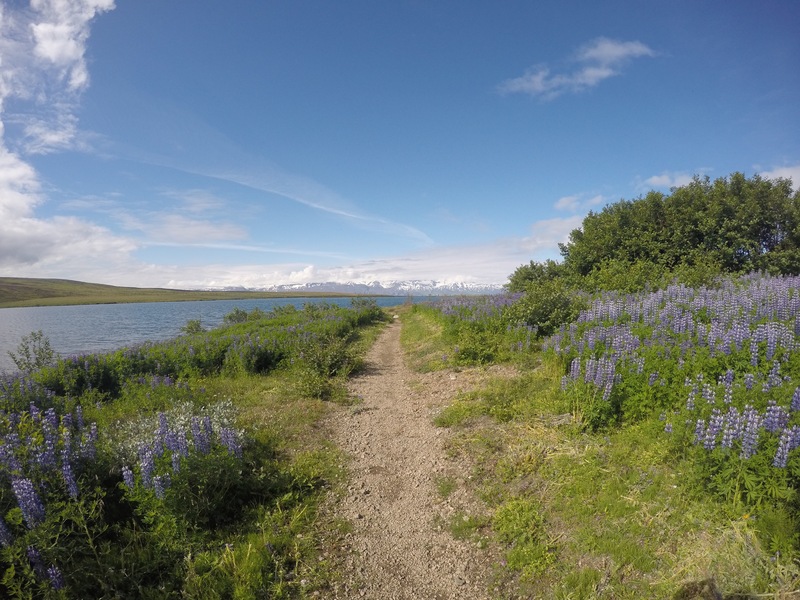 I took the car up into the hills of Husavik and found a large lake just inside the tree line. The town was now hidden but the snow capped mountains of the hills beyond were visible and the whole place tinged with the purple of the lupins. It was serene with glassy water and birdlife. 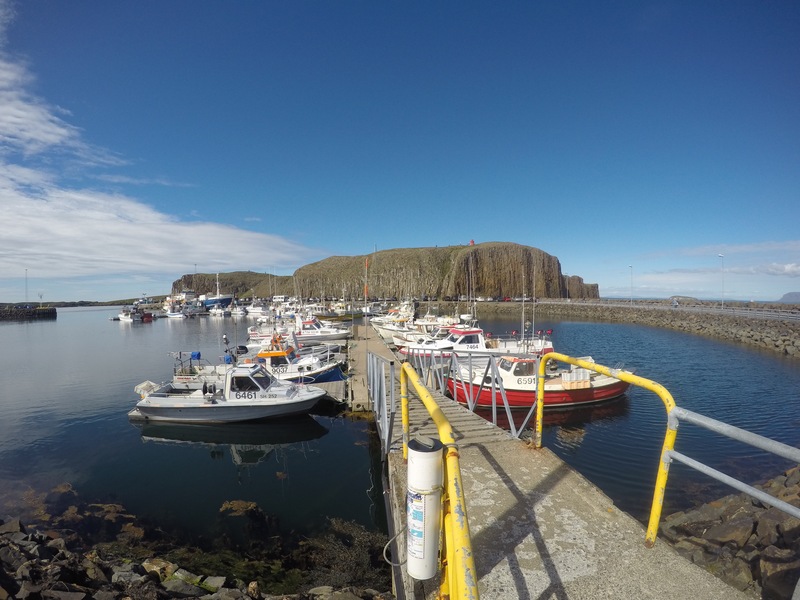 The town was small and picturesque with craggy cliffs protecting the port and easy place to spend a few hours exploring. It even ticked the boxes of lovely coffee which doesn’t appear to be high on Iceland’s priorities. 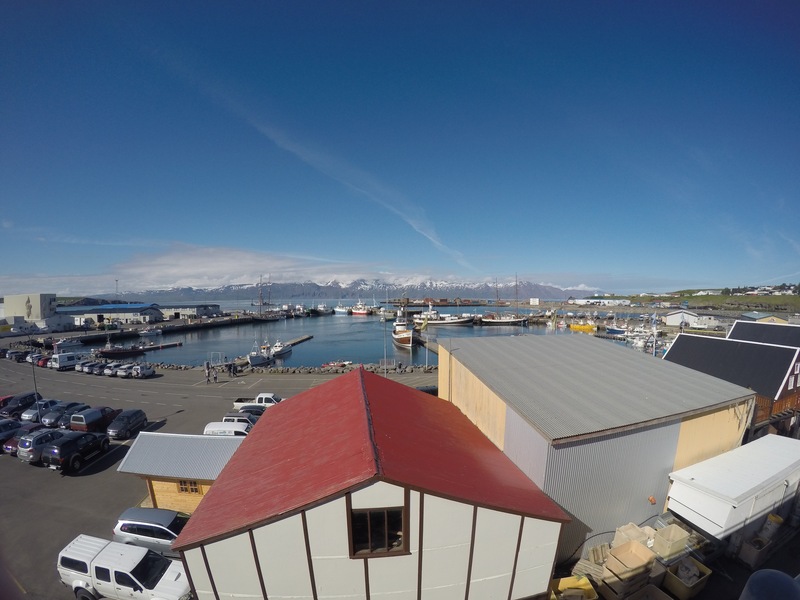 The others were full of enthusiasm about their morning on the boat having seen humpback whales, and so we left Husavik fully solar powered for Lake Myvatn. 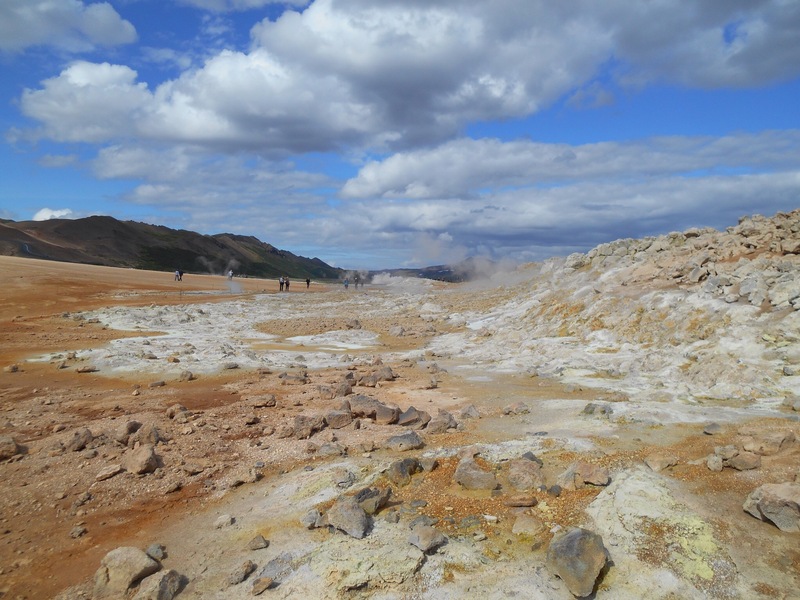 This large lake is another centre for geothermal activity and the colourful hillsides so reminiscent of Landmannalaugar appeared beyond. 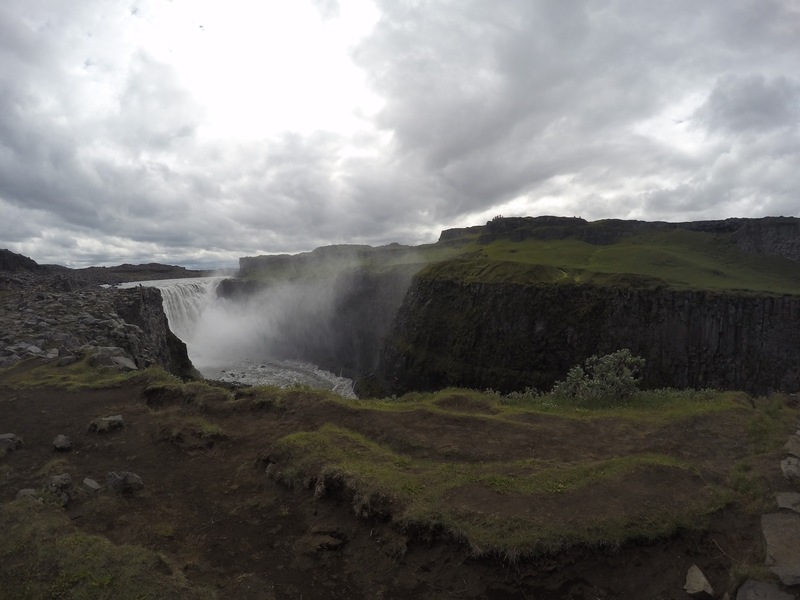 A lot of the energy from this area is being farmed by power plants to be used around Iceland. The steep mountain climbs were tough for our laden car but revealed crazy colours and shapes at every turn. 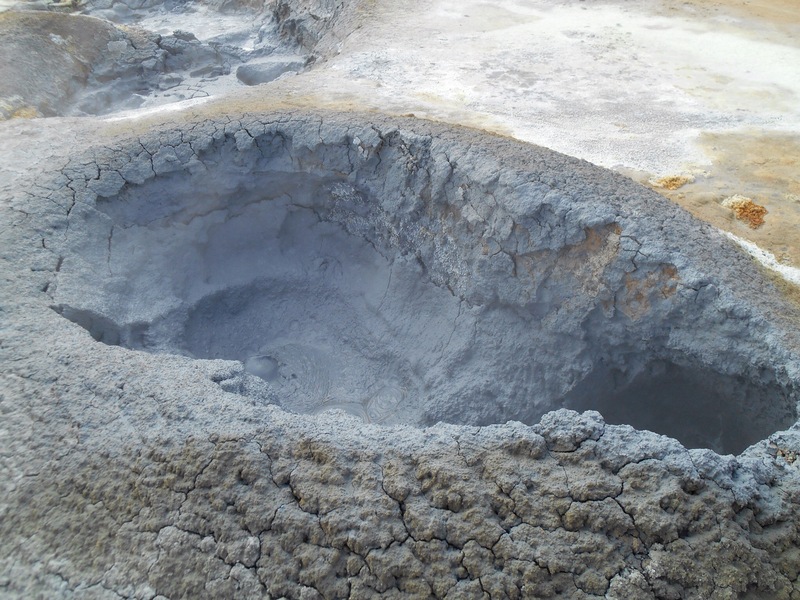 At Námaskard the smell of sulphur and steaming rock piles were the first sign of a fiery earth. 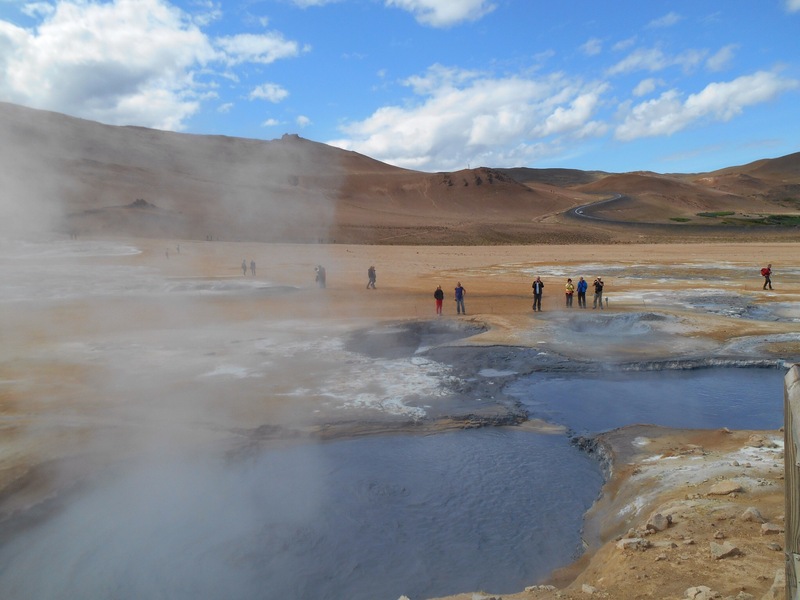 There was bubbling mud pits, spluttering surges of water and clays of reds, oranges and whites. 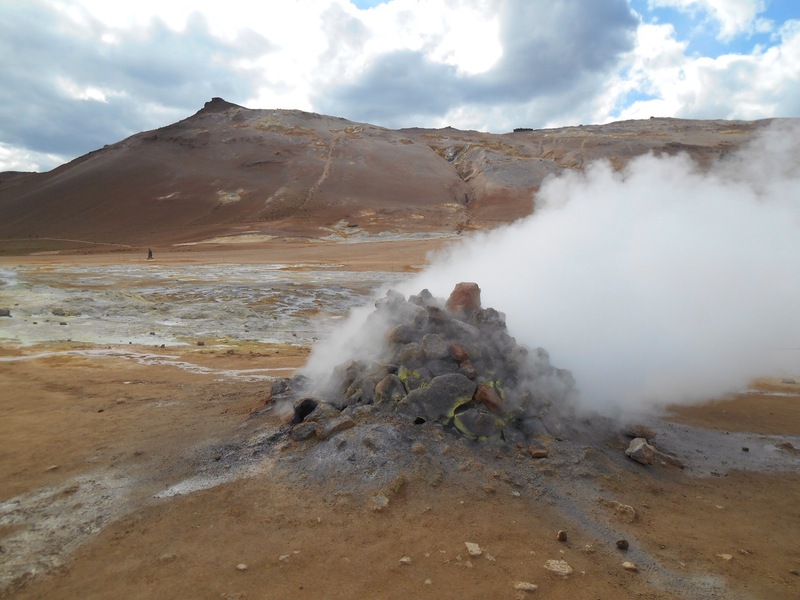 We then made for Krafla, a lava field with many hidden surprises of rock formations and lakes. 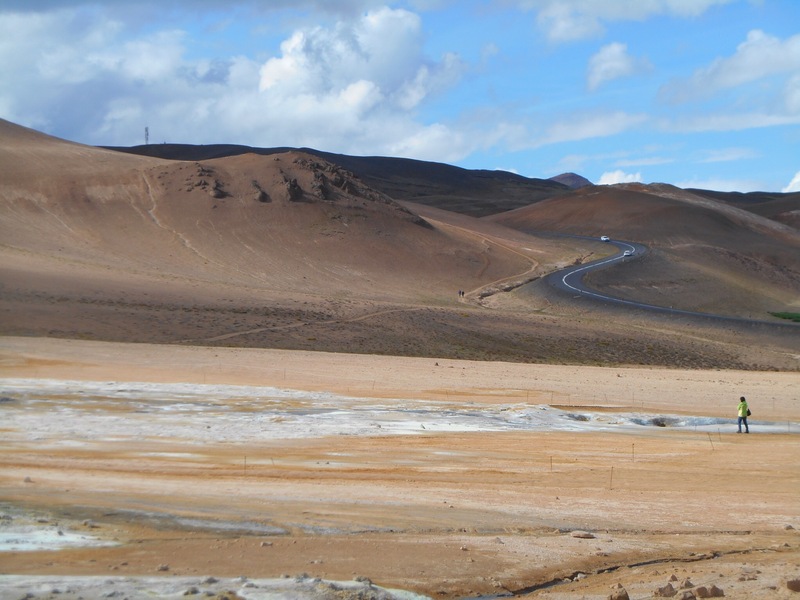 In fact a day on the road would not be complete without Cal picking up a piece of lava and saying ‘wow, hold this, it’s so light!’ The bright sky accentuated the amazing range of colours in this whole area. 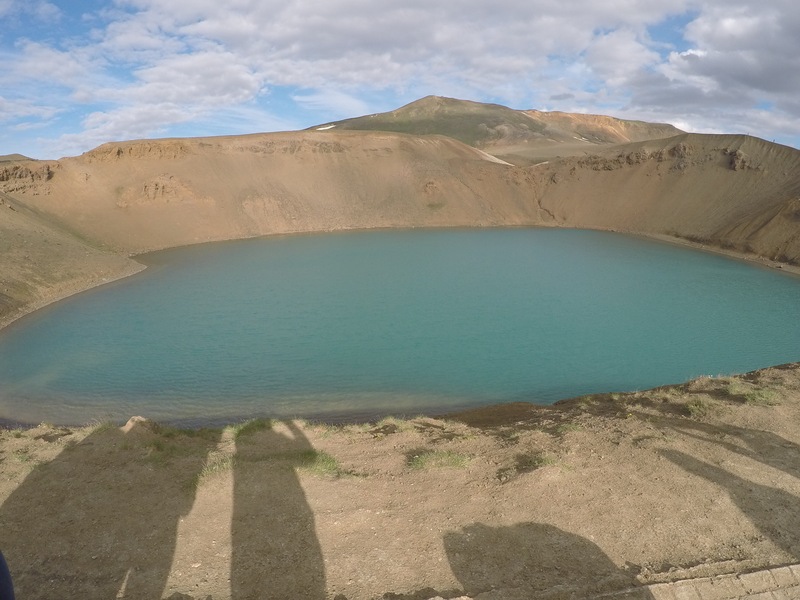 We battled hefty winds to reach a crater lake filled with brilliant blue water. We made camp lakeside in a beautiful spot where fluffy ducks explored between the tents and enjoyed our routine night cap of hot chocolate by the tents with a game of cards. The next morning Myvatn had many more volcanic treats in store for us. 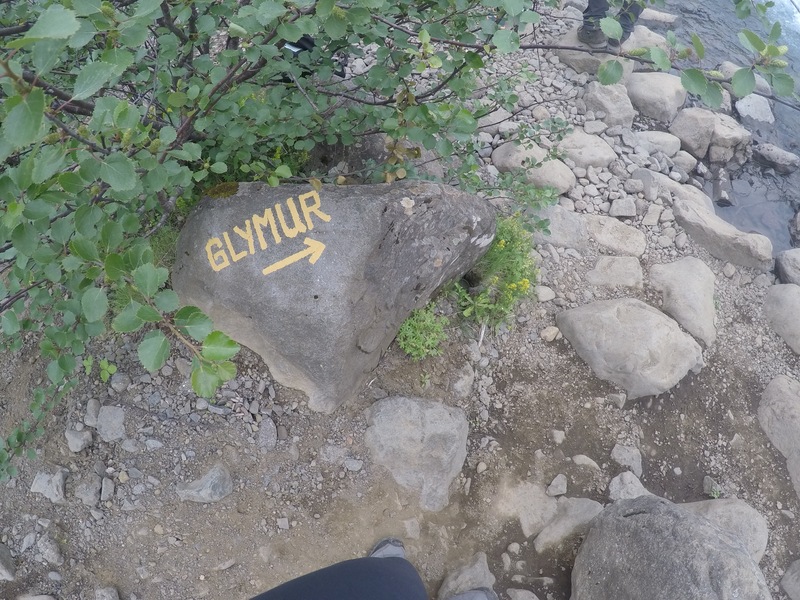 We climbed the crater of Hvarfjall then stopped for crazy lava formations at Dimmuborgir. 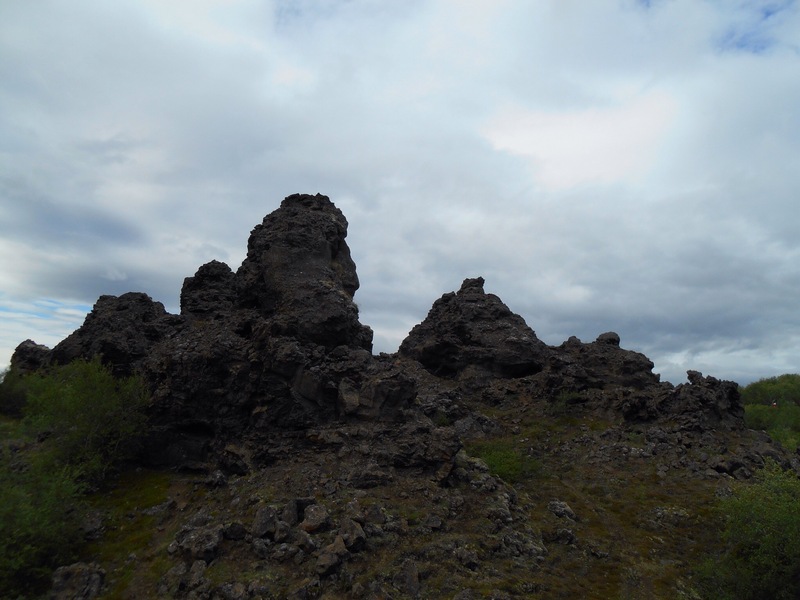 Clamouring around between jutting rocks and into lava caves passed the morning. 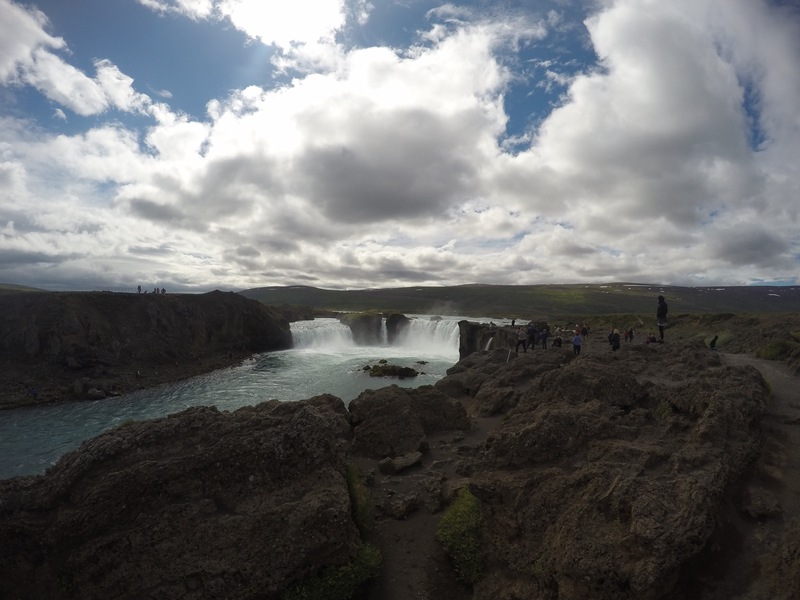 On the drive to Akureryi we stopped at Godafoss waterfall meaning waterfall of the gods. Another impressive plume, this one splits over a rock in the middle looking like a gap toothed grin. 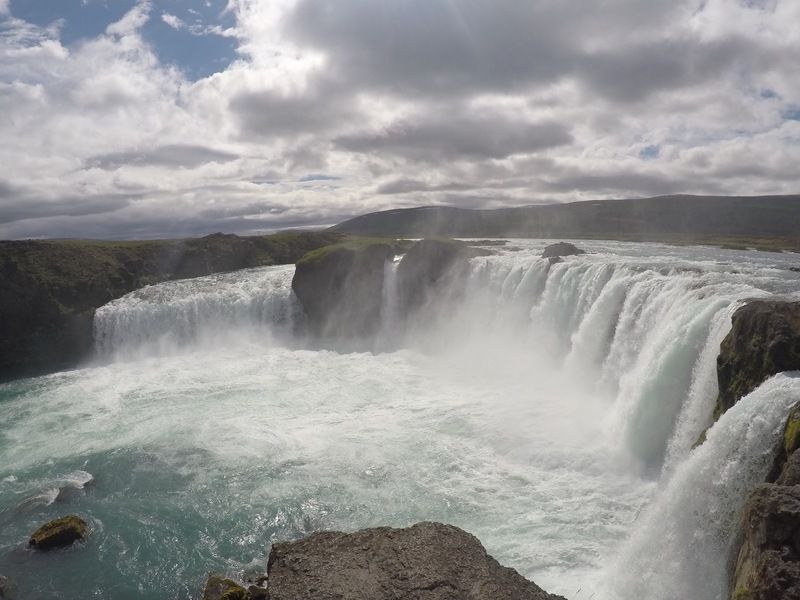 The kick of wind and mist gave this waterfall a feisty personality. 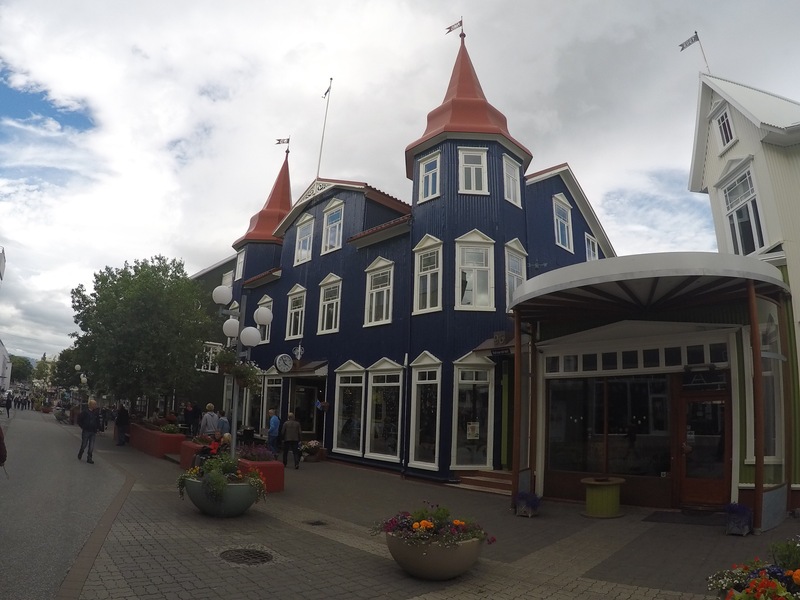 Akureryi, a small way down the road, is Iceland’s second city. 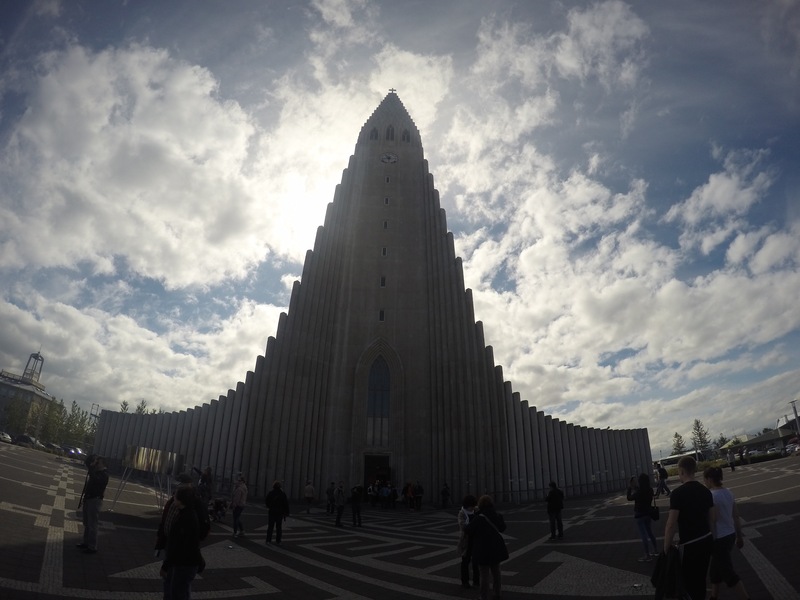 You approach it from across the water, it’s modern church standing out from the relatively flat skyline and colourful houses which characterise Iceland. 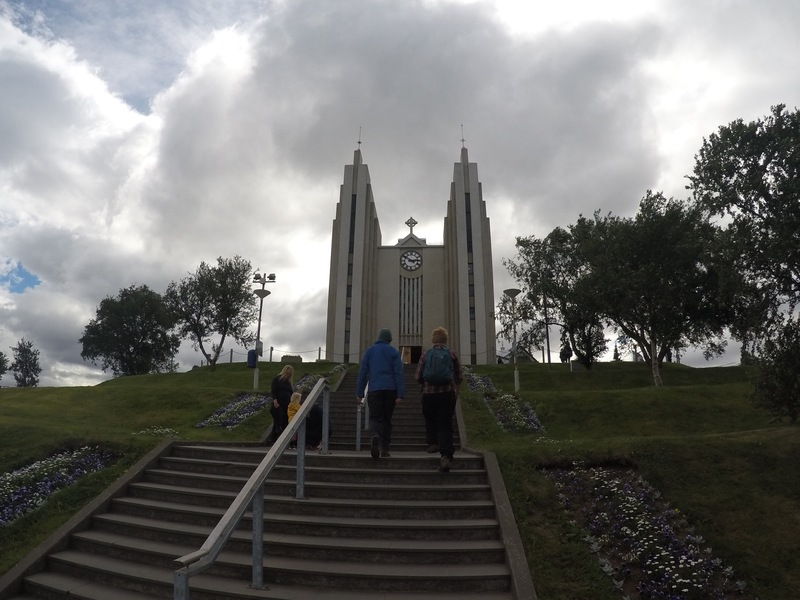 We walked through its arty streets where trolls patrolled the sidewalks and robots marked the walls, up the 100 steps which lead to its modern church, Akureyrarkirkja. From here we continued into its botanic garden, the leafy greens a perfect place to look over the water and docks below. Being more north, the winters are long and harsh and we did wonder whether the gardens are in a constant three day cycle, the plants replanted most mornings to survive. 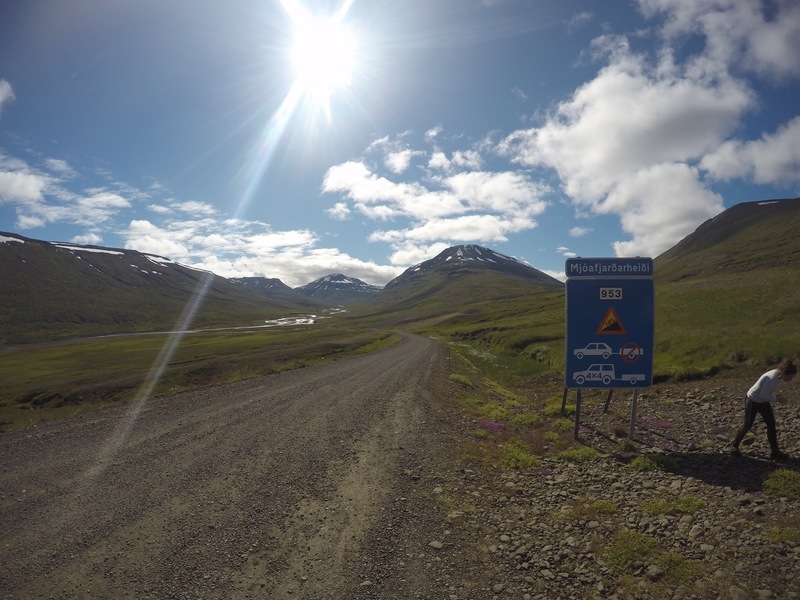 The road out of Akureryi and west once more was stunning. We sidled through a mountain pass with farmland and the occasional house on each side feeling like we could see for miles in every direction. In the warm evening with the music blaring it felt like the perfect roadtrip setting. 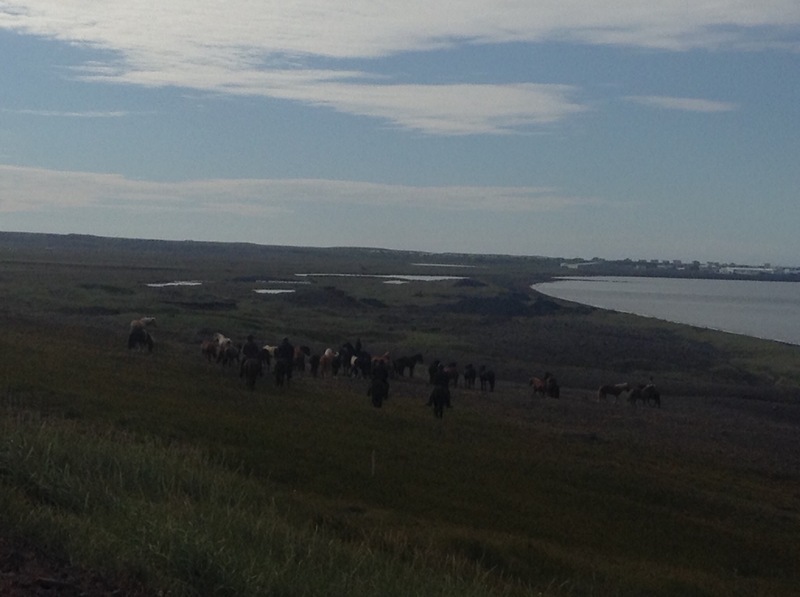 A favourite sight is the Icelandic ponies, often numbering fifty or more they canter guided perfectly following under the instruction of three or four riders. We stopped in a small town to make dinner in the sheltered partitions of a bird watchers hide. It’s colourful houses, church and run down streets on the sea showed little signs of light. 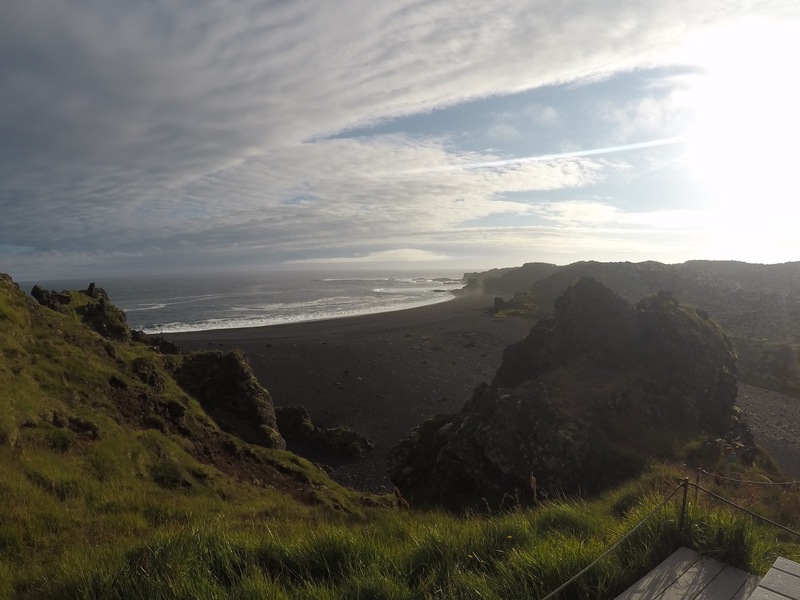 On a beautiful morning we continued west and soon turned off ring road 1 onto Snaefellsnes peninsula. 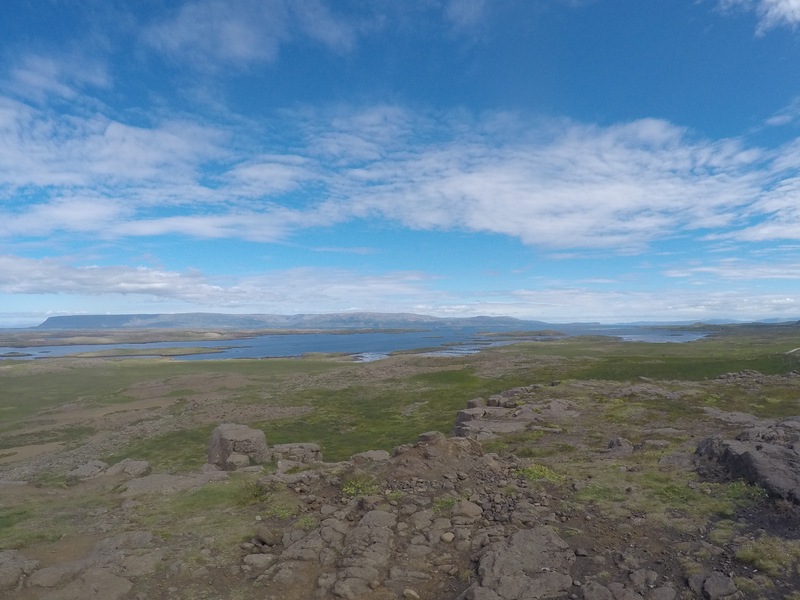 The scenery continued to be dramatic and we could glimpse the west fjords off to the right side. The boys called out for us to stop at the roadside to explore a beautiful creek which we climbed down into. 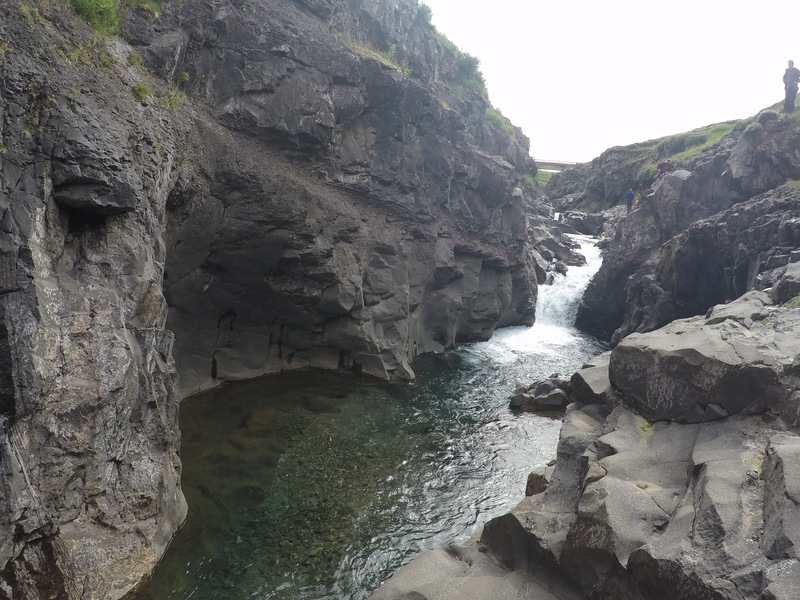 The water had carved a path through the rock out to the sea and cold, crystal clear water passed through. After paddling our feet through we concluded the water was very, very cold and Connor was the first to decide to take the plunge, literally. He was in and out within seconds. Kylie convinced a very uncertain Cal and the three of them jumped in and had a spine tingling paddle in the glassy water. 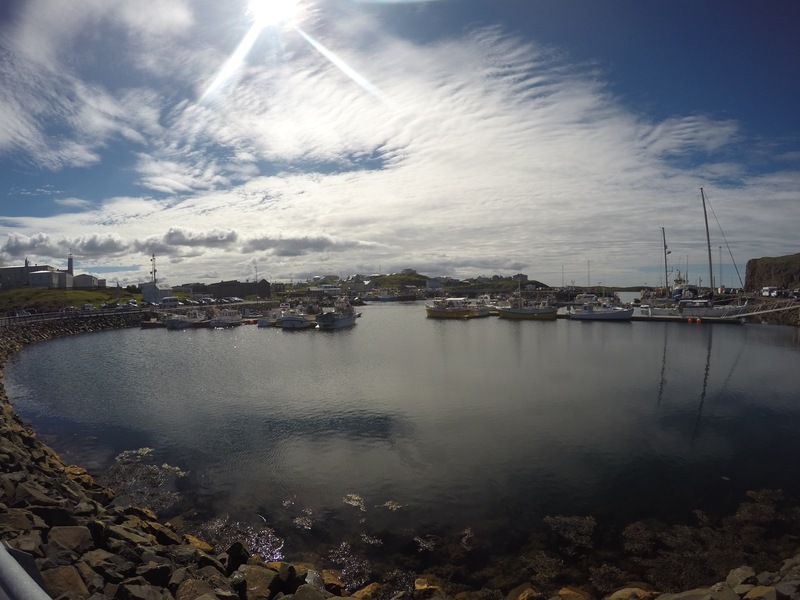 We followed the beautiful coastline and visited Stykkisholmur, the biggest town on the peninsula and a perfect combination of Icelandic charm and fishing town. 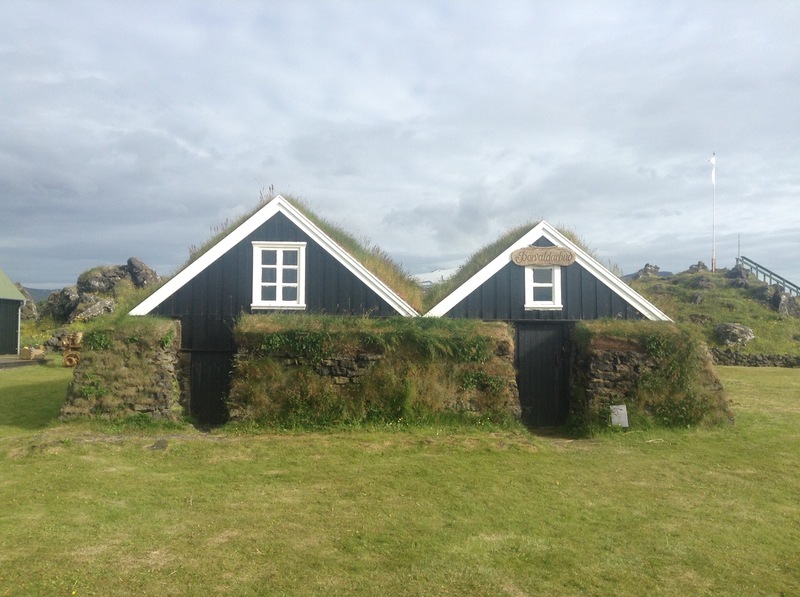 The coloured houses overlooked the port of small fishing boats and sea birds circled overhead. 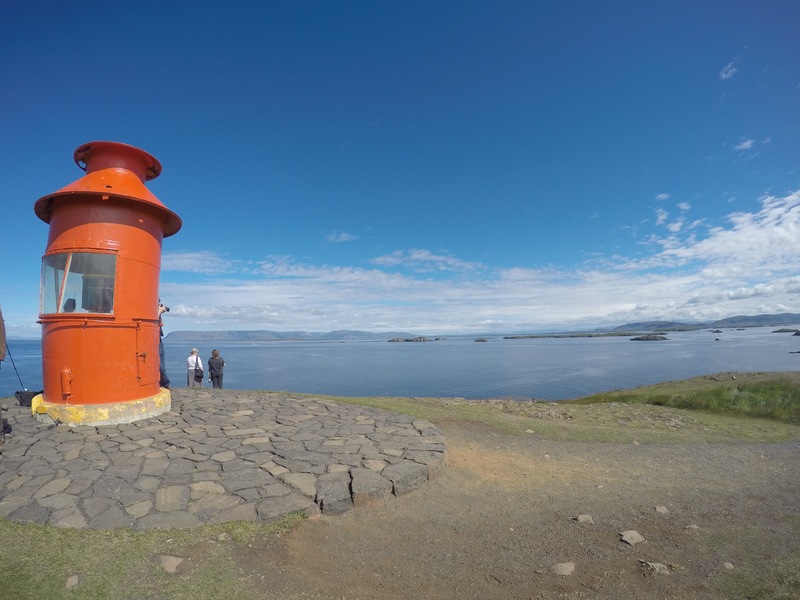 Among the many islands in the water, a mount jutted out with a lighthouse on top, a perfect place for sunbathing and watching the jellyfish and ducks frolicking below in the water. Being by the coast, we were unable to resist the fish and chips. 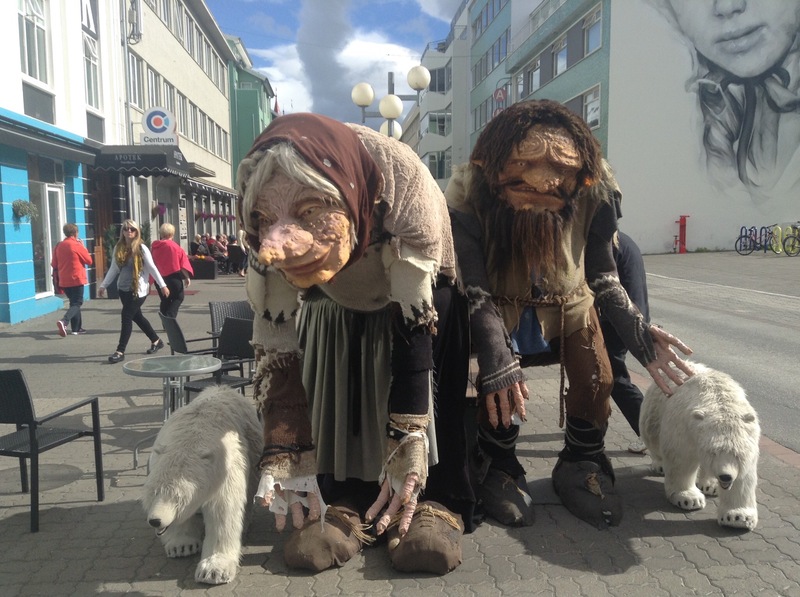 Descend, bold traveller, into the crater of the jökull of Snæfell, which the shadow of Scartaris touches before the beginning of July, and you will attain the center of the earth. I did it. 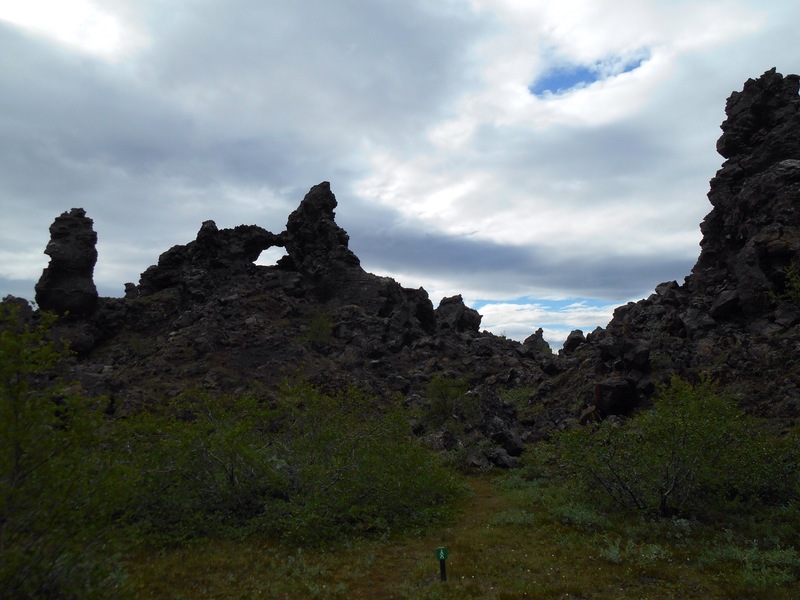 The land on the drive to the volcano was marked with lava fields. We turned off the main road to drive through a trail cut by Viking Beserkers in 982AD, Beserkjagata. 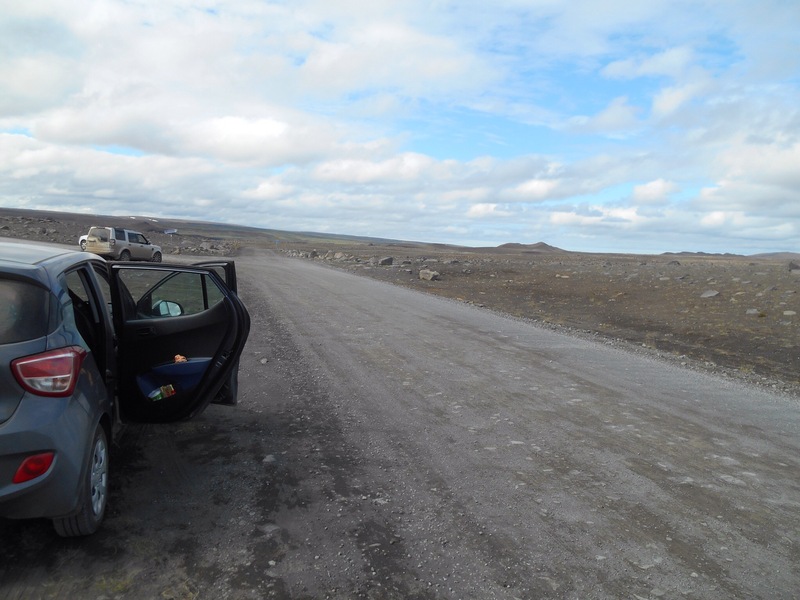 We gave the clutch a good workout as we stumbled over potholes and rocky land and stopped to admire the vast stretches of lava formed desert like surroundings. 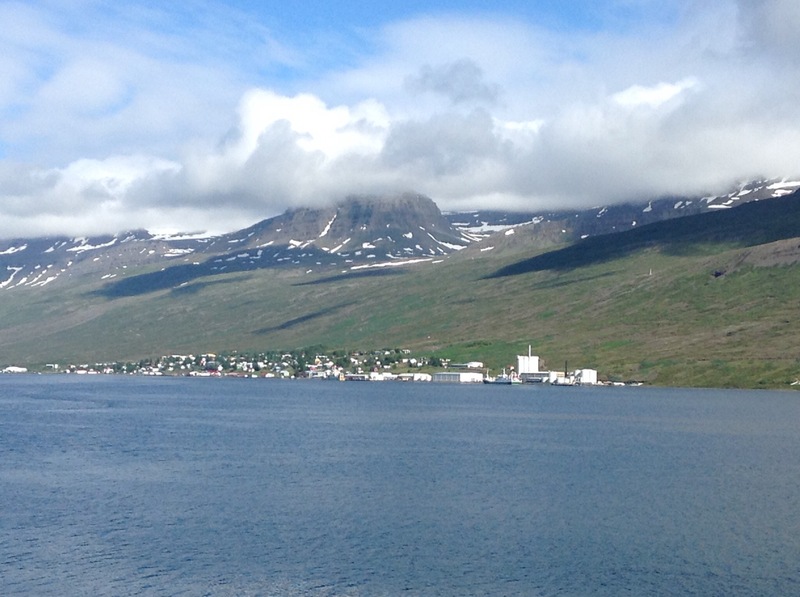 Further along, Grundafjordur sat in the shadows of large mountains. 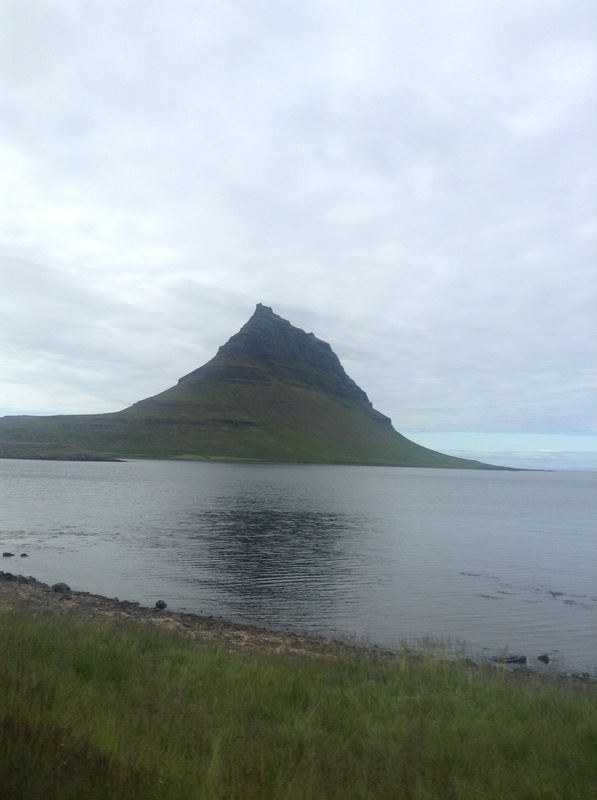 Made famous by its highly recognisable neighbouring mountain, Kirkjufell made famous by the movie ‘The Secret Life of Walter Mitty.’ We stopped to marvel the waterfall and mountain which lay on a beautiful stretch of sparkling coastline. 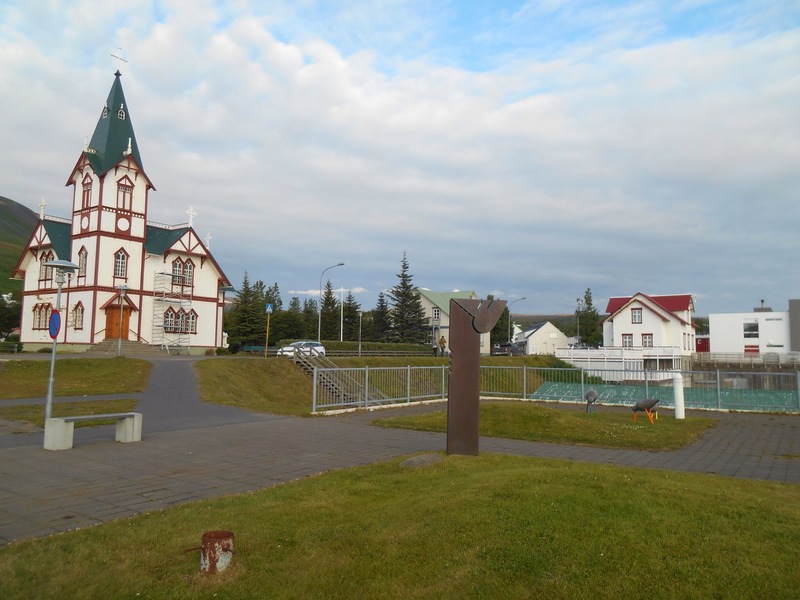 The rest of the towns we passed through were fishing villages, a few buildings and a church at most. 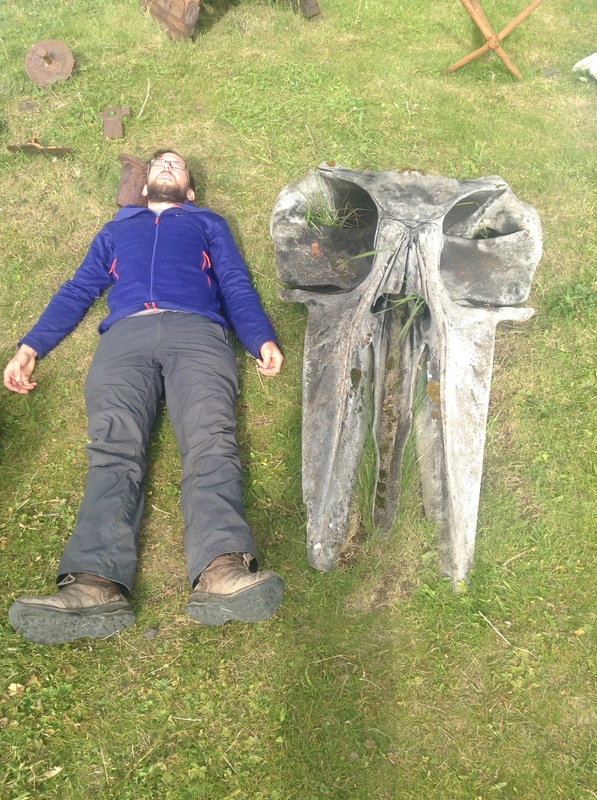 With rumours of passing blue whales and we marvelled over collections of huge ribs and skulls. 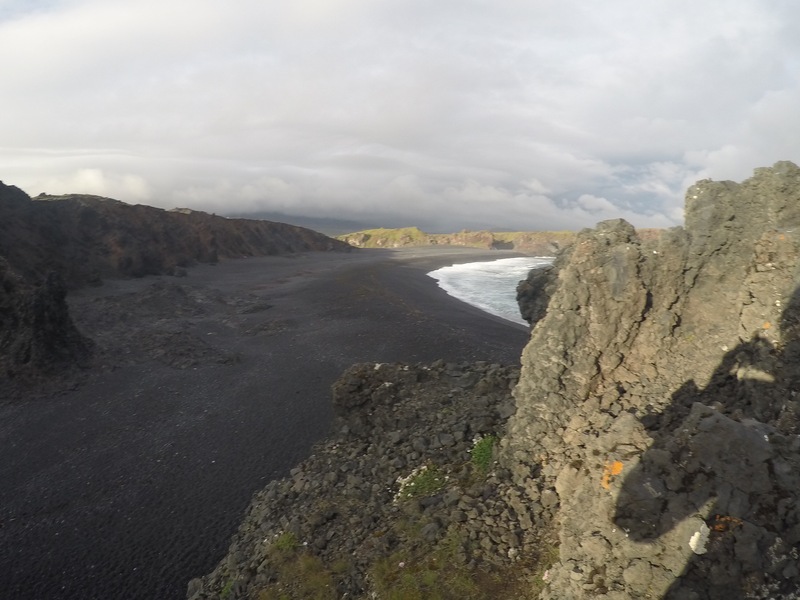 A highlight of the day was finding (eventually) a gorgeous stretch of empty black sand coastline at dusk. 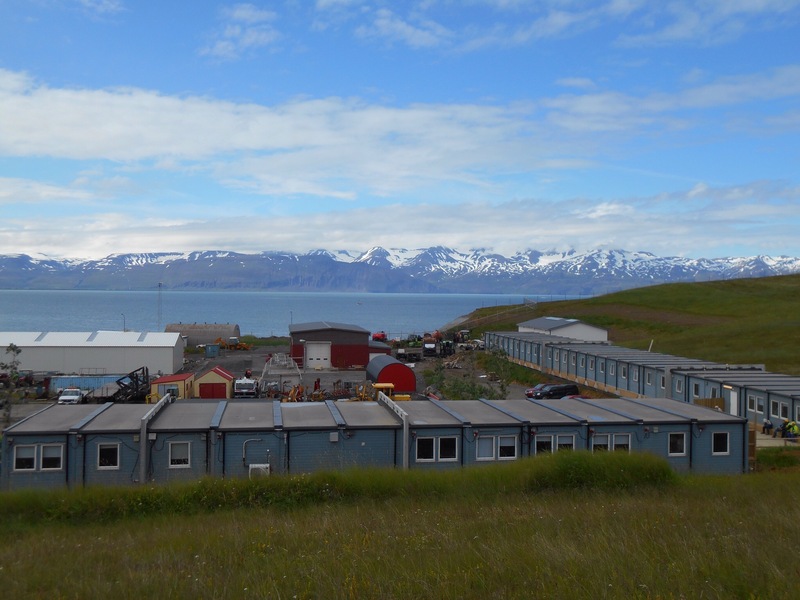 It was a site of where men would be tested for their strength to work onboard a boat as crew. 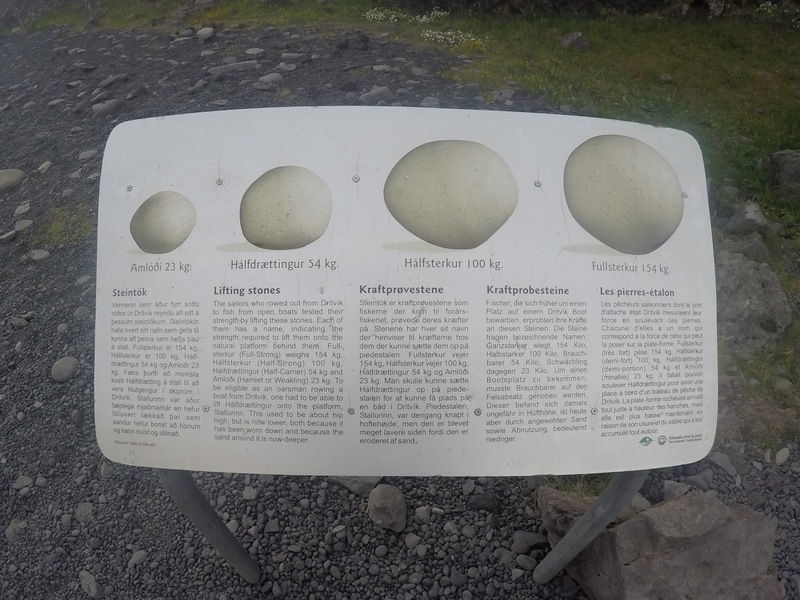 ‘Useless,’ ‘weak,’ ‘puny’ and ‘full strength’ were the four ratings which corresponding to four rocks, the heaviest, a massive 150kg rock. It was also the sign of a British shipwreck and rusty metal lay strewn across the beach. Apart from a few others, the only sign of life was birds and the red seaweed on the polished black pebbles. We walked the length and climbed the rocks where shards of polished stone made the formations look like the Sphinx from Ancient Egypt. We had fun running up and down, burning on the energy we had accumulated from eating so many chocolate raisins. It had been a long penultimate day but still at the end of the peninsula we pushed on into the night. The fog covered the hill but out to see the sky was clear. We encountered sheep on the road, undeterred by us approaching. 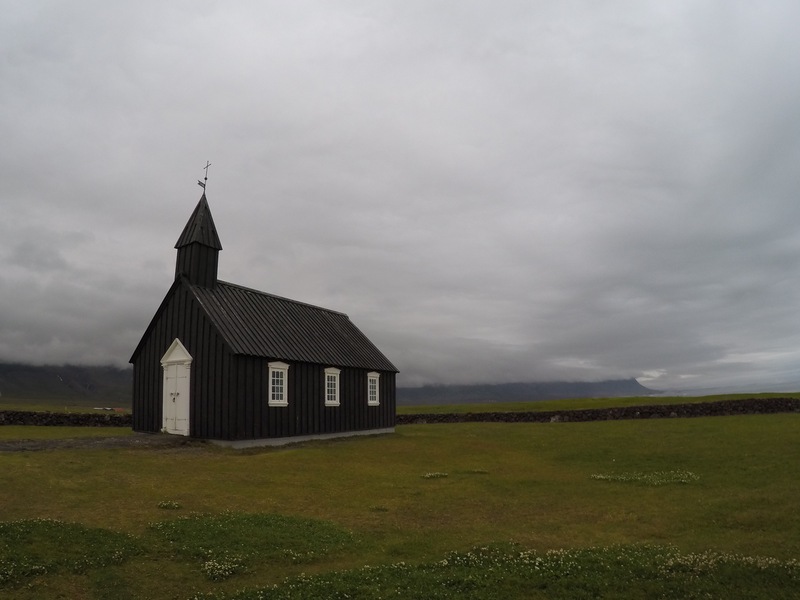 We pulled into small hamlet of Bladir where a guesthouse and a simple but pretty little church was the only signs of life. We made camp a short way down the road. 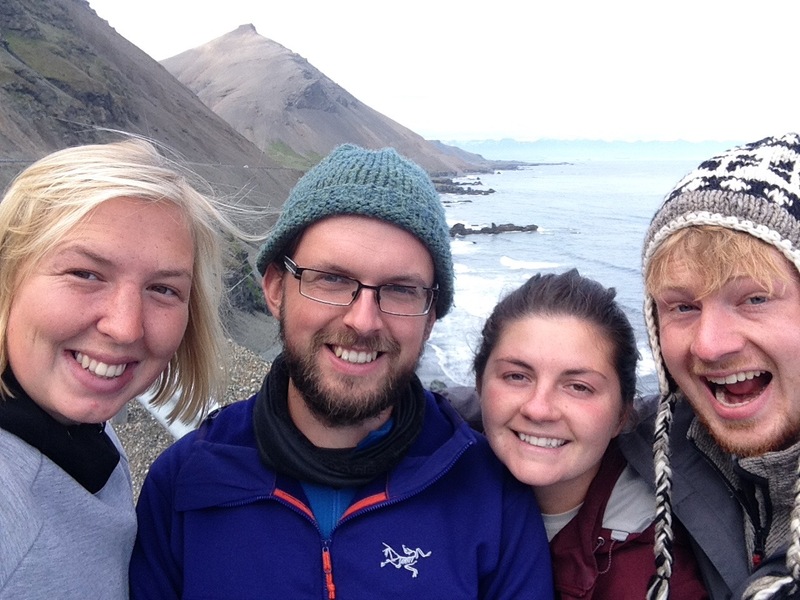 As we followed the coast to our right side, we counted down the kms back to Reykjavik. 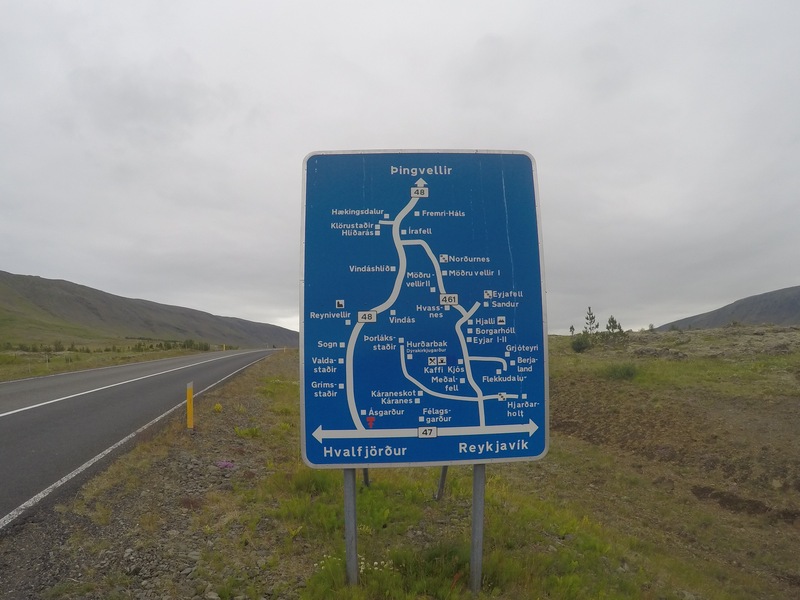 Many of the road signs had amused us during the week, requiring a stop to decipher their complicated and rather disorientated guide. 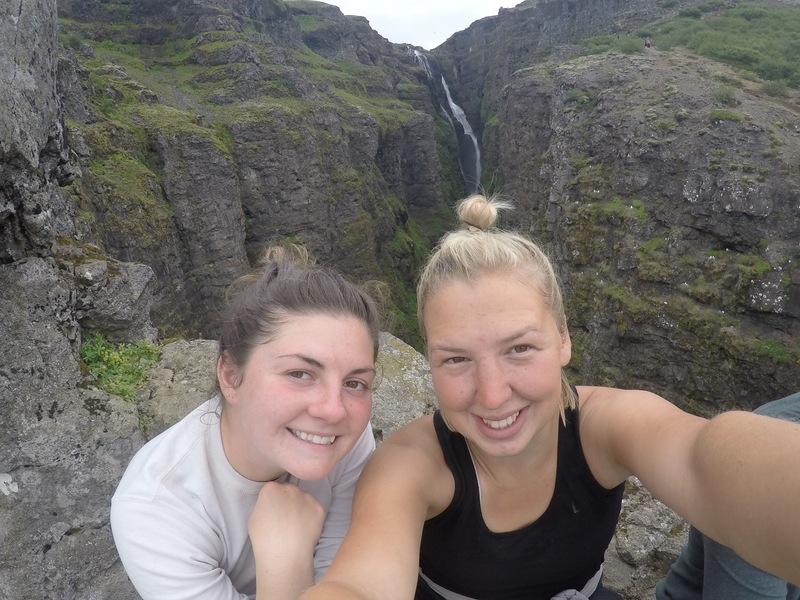 We drove around Hvalfjordur and stopped off for our final waterfall of the trip, Glymur. It was tucked back down a dirt road and still from the car park was a good walk which took us through caves, across rivers and up steep climbs. We knew it was another European record breaker, Europe’s largest drop at 198metres, so we’re be used as to why we couldn’t see it. 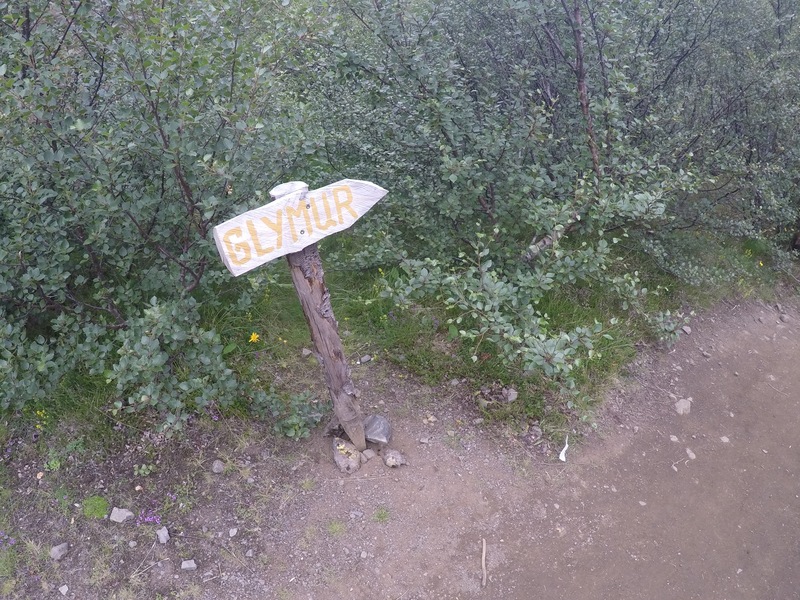 After climbing and sweating we saw it from a vantage point a distance away, a thin stream of water falling a long distance and the green spell it casts on the nearby hillsides. Cal left us at 2am and slightly delirious we bid him an emotional farewell. The next day, without a car to bundle everything into, we packed down our luggage to head to town. 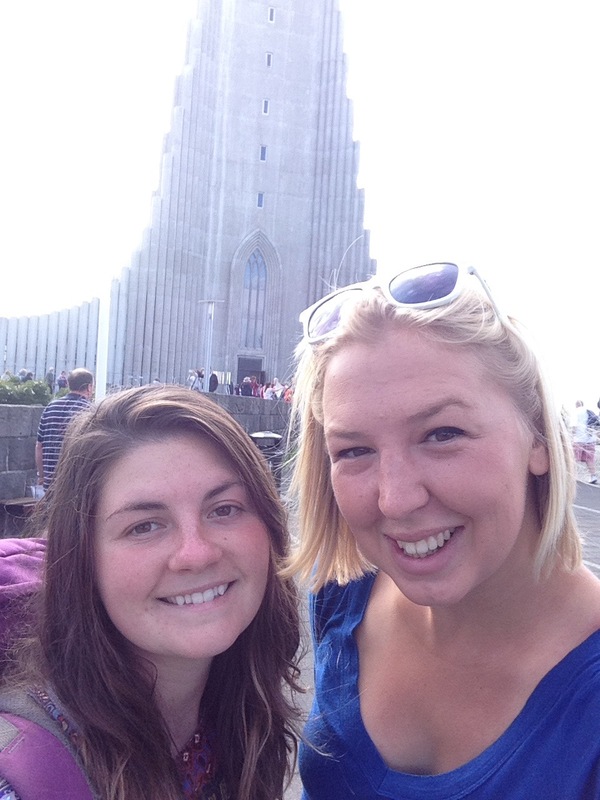 Our final aim was to see Hallgrimskirkja, the beautiful church on the hill. 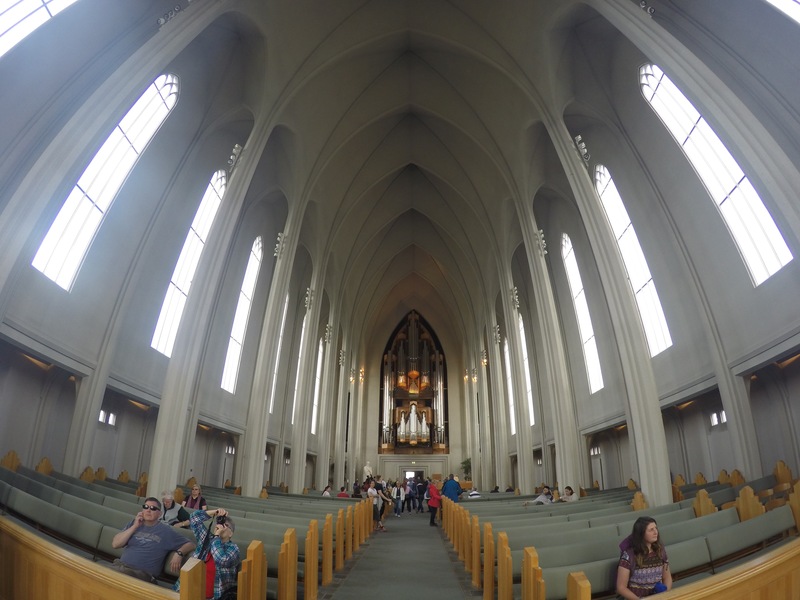 Up close it didn’t disappoint, it’s columns forming a curve into the sky, beautifully Icelandic in every way. We had a coffee in a quaint, coloured cafe and made for the station, the journey over. 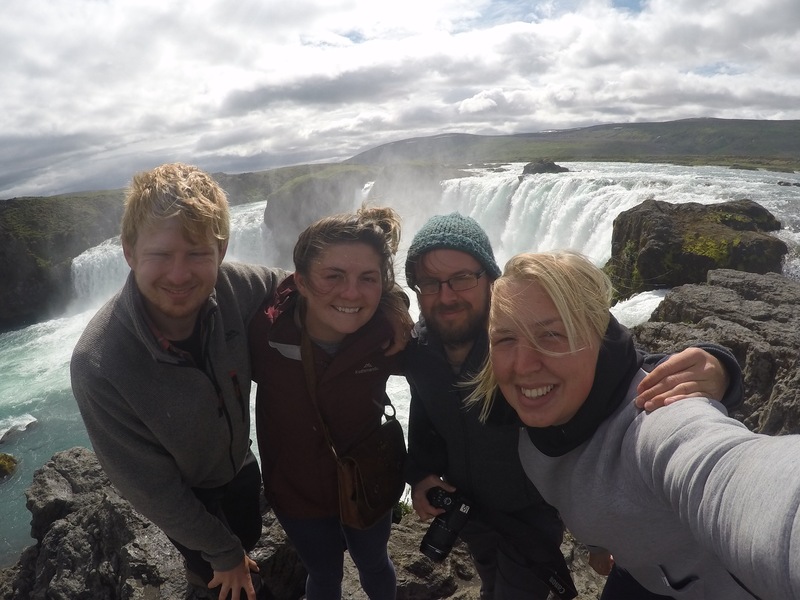 The return made us reminisce of the cold which had greeted us two months ago, so unsure what Iceland would hold, hoping we would be able to get our tongues around Takk Fyrir. 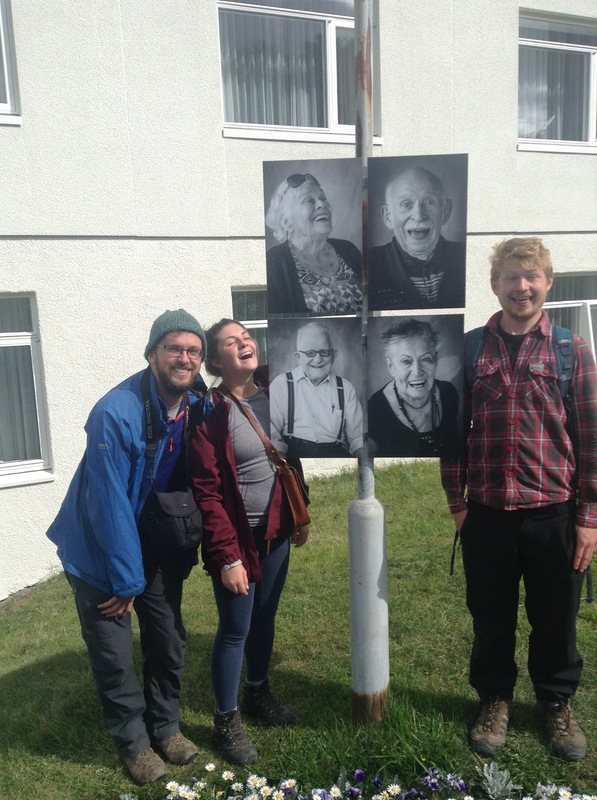 In reality Iceland taught us so much, introduced us to great friends and gave us good laughs. I don’t think either of us doubted it would, yet we still couldn’t have imagined the journey. It looks amazing! I want to go.